Produktinformationen "Survival Korean Crash Course"
어서 와, 한국 대학생활은 처음이지? Welcome! Is it your first time at a Korean university? 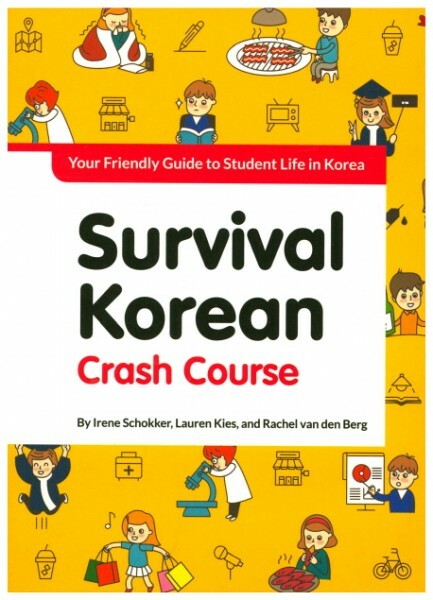 Survival Korean Crash Course is a practical Korean language guide written by three exchange students from Leiden University in the Netherlands, which runs the only Korean Studies major in Europe. As “Your Friendly Guide to Student Life in Korea,” the book is a friendly, fun read, like the writers are personally sharing their stories of life in Korea to a good friend. The book also contains frequently used Korean words and idioms. The three writers—Irene Schokker, Lauren Kies, and Rachel van den Berg—fell in love with life in Korea as exchange students at Yonsei University, where they met Korean friends, hung out at university festivals and student outings, joined student clubs and activities, and even raced against Koreans students in the fierce competition to register for classes. They went through difficulties too, as they got used to the cultural differences. Before they learned to call out “Auntie!” at a restaurant or ring a bell on the table, they would wait ages for a server to finally come take their order. And they had no idea that, according to Korean drinking customs, they should have turned their heads away when drinking with their seniors. Based on their own newbie mistakes and confusion, they put together this Survival Korean manual, featuring eight chapters organized by situation. The book lays out essential words and expressions commonly used in daily life and various situations that international students in Korea often encounter, including school classes, searching for a place to live, navigating the streets, ordering food at a restaurant, enjoying leisure time, shopping, and emergencies. Based on the first-hand experiences of the authors themselves, who have just finished their exchange semester and returned to the Netherlands earlier this year, the three students pass on their tips for the things foreigners living in Korea find difficult and the Korean expressions they find confusing. This book will be a useful guide for students who plan to study in Korea or are looking for a mentor on Korean life, with authentic advice and recommendations from real exchange students. Irene Schokker, Lauren Kies, and Rachel van den Berg are students in the Korea Studies masters’ program at Leiden University in the Netherlands. During their undergraduate years as Korean Studies majors at Leiden, they first visited Korea as exchange students at Sungkyunkwan University, and their love for Korea grew all the more. They returned to Korea in 2016 as exchange students at Yonsei University as part of their graduate studies. They are currently in the Netherlands, writing their dissertations on Korea after spending a year in the country. The authors wrote this book to share the real Korean language and culture they enjoyed with their first-hand experiences with Korean food, noraebang, and street performances. Weiterführende Links zu "Survival Korean Crash Course"
Unser Kommentar zu "Survival Korean Crash Course"
Kundenbewertungen für "Survival Korean Crash Course"